Founder of supermarket chain defends coexistence policy, blames Thursday's attack on 'bad luck', despite history of terror attacks. Rami Levy, founder of the popular chain of Israeli supermarkets, has long held up his company as a model of coexistence between Jews and Arabs. Despite criticism over security concerns and fears of assimilation, Levy has defended the stores three “coexistence” branches, where Palestinian Authority Arabs and Israeli Jews shop together. When terrorists struck the Sha’ar Binyamin branch, killing Tuvia Weissman and wounding another shopper, Levy doubled down on his store’s “coexistence” policy, telling Army Radio the attack was simply a result of “bad luck”. “Security was heavy and there is no way to explain the incident other than an unfortunate series of events,” Levy said. Yet Thursday’s lethal attack was not the first act of terror targeting the Rami Levy chain. In fact, since December of 2014, all three “coexistence” branches have suffered attacks. On December 3rd, 2014, a terrorist stabbed shoppers lined up near checkout counters at the Mishor Adumim branch of Rami Levy, wounding two before being shot by a security guard. 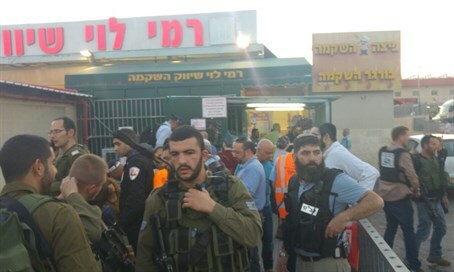 Rami Levy’s Gush Etzion branch was struck on October 28th, 2015 when an Arab terrorist brandishing a knife targeted shoppers, stabbing one woman in the back so deeply it buried the blade in her spine. Last November Sha’ar Binyamin, the site of the most recent terror attack, was the scene of another stabbing attack when an Arab terrorist stabbed a middle-aged Israeli man just outside of the supermarket. Following last Thursday’s attack, the Jersualem Belt Forum warned that, given the chain’s history, more attacks on Rami Levy’s three coexistence stores were inevitable.